The El Dorado Education Foundation (EDEF) recently announced the winners of their 2017 teacher grants. Congratulations to all the hard-working teachers who submitted grant proposals. Through 31 semesters, a total of 250 grants have been provided through the EDEF. The judging team from Southern Arkansas University was excited about the grant applications submitted. 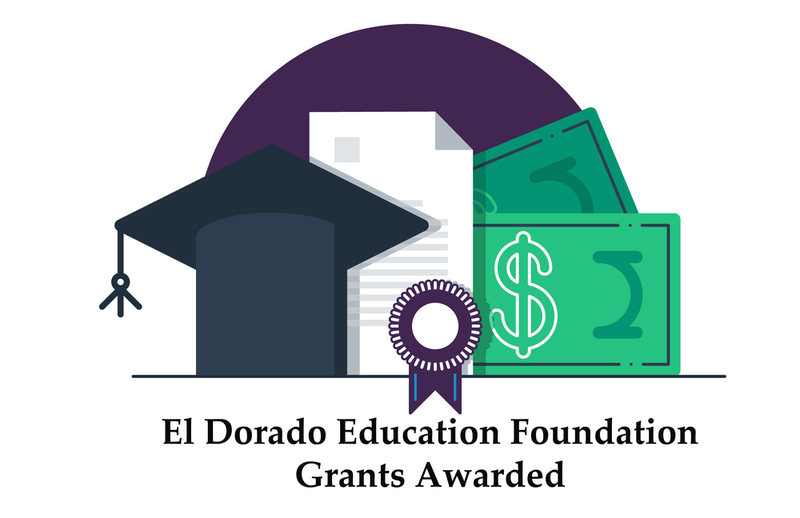 We are proud of all El Dorado teachers, schools, and students and look forward to seeing how these grants are used to further our students' educational experiences. Christina Turner – Washington. Approximately 150 6th graders. Subjects: Math, Social Studies, Computer Science, Careers, Technology, Fine Arts, & Liberal Arts. This project is designed to help students see past “functional fixedness”, or the idea that an object or skill set can only be used for one thing. Too often, students believe that skills developed in literature classes have no place in a math or science classroom. Students will develop soft skills, by working together on numerous points in groups, to solve challenges or complex problems. This will expose students to more possibilities with computers and STEAM (Science, Technology, Engineering, Arts, and Math) careers. In groups of three, students will research, design, create, and program their own wearable animatronic creatures or puppets (similar to Jim Henson’s creations). Students must develop their creatures’ back stories, and set up appropriate habitats. Each one must perform simple functions such as blinking, walking, flapping wings, etc. By using programmable robots, students will learn coding, plus how to work together, problem-solve, and present ideas to large groups. With their animatronics, students will perform in groups with their peers, with ultimate goals of making their creatures as autonomous as possible. Tobie Sprawls – Hugh Goodwin. Approximately 150 2-4th graders. Subjects: All core subjects. Due to demand from students and others, this project is designed to expand an afterschool STEM (Science, Technology, Engineering, and Math) program into all second, third, and fourth-grade classrooms. Teachers recognize that students need a strong program that promotes involvement and learning. Research indicated that STEM-based projects offer students the opportunity to develop critical thinking skills, by improving student engagement and core subject literacy. Therefore, this project was created. It involves utilizing STEM-based projects, combined with an inquiry-based method of instruction, to promote engagement and learning. In one example, students may be asked to create a video game containing a word problem, with each key designed to provide a different movement of the computer avatar. In another, bots will be programmed. New problem-solving situations will be explored each time they complete a task. Students will work individually and in groups. Multiple robotic devices and technology also will be used. Katie Harwell, MaKenzie Lee, Suzette Calloway, & Maria Villegas – Washington. Approximately 650 5-6th graders. Subjects: Art, Music, Literacy, Science, Math, & Drama. This project will provide the Art, Music, and Drama departments with an exciting new way to integrate Literacy. The Fine Art classes will work together this year to discover and present the Disney Musical Alice in Wonderland JR. The Music Production classes will focus on performing the Disney Jr. Musical, while the Studio Art classes will plan and design the sets, costumes, and props for the play. Mini Art and Mini Music will spend class time discovering Lewis Carroll’s original stories Alice’s Adventures in Wonderland and Through the Looking-Glass. Included in this project will be an area Artist-in-Education, Maria Villegas. Students will focus on analyzing poetry in these stories, as well as decoding the complex text. These original stories and poems will not only introduce and explain the schools’ spring play to the students, but they will also help students master many important Literacy skills. In the spring, the school will sponsor an Art Show, and the musical will be presented to the public, to showcase the students’ works. Carolyn Smith, Sherry Hill, Tammy McCloy, Josh Kingery, Becky Streeter, Calandra Brown, Nathaniel Sutherland, & Dee Moss – Barton. Approximately 696 7-8th graders. Subject: Science, Technology, Engineering, Math, Computer Science, & Literacy. This project will allow every student at this school to experience the Engineering Design Process. It will incorporate the Arkansas K-12 Science Standards, which include eight science and engineering practices, as well as many Arkansas Computer Science practices (perseverance, collaboration, patterns, communication, and problem-solving). The classroom teacher will present each class with a challenge. One grade level will be tasked with creating a hovercraft manned by a student to glide across the gym floor. The other will create a cardboard boat to hold two students paddling across the city pool. By use of various types of equipment, students will work in groups to research aerodynamics, lift, air pressure, Newton’s Laws, friction, buoyancy, center of gravity, and/or other scientific principles. This project will not only allow students to experience science, engineering, and computer science practices; but also to work collaboratively, think critically, communicate effectively, and be creative. 5. "The El Dorado Promise & STEM Success"
Shelley Forbess & Taylon Steele – EHS. Approximately 100 9-12th graders. Subjects: EAST & AP Physics. This project’s purposes include inspiring current students to consider careers in STEM and medical fields, highlighting the impact of the El Dorado Promise, and demonstrating to prospective employees of local industries the accomplishments of former students. In order to fulfill these purposes, EAST classes will design and create full color, professional-quality posters that feature EHS students who are now in STEM (Science, Technology, Engineering, and Math) or medical fields. The posters will include their university degrees and current employment, as well as photographs. Many former students have become scientists, engineers, physicians, pharmacists, nurses, and therapists. By giving them visibility, people walking the halls can see what students are prepared to accomplish once they leave EHS. Since the posters will be designed and produced in-house by EHS students, these students also will employ technical STEM skills. Rhonda Simmons, Bonnie Haynie, Tom Simmons, Carolyn Smith, & Jeannie Strother – Hugh Goodwin, Northwest, Retta Brown, & Yocum. Approximately 1,824 K-4th graders. Subjects: Literacy, Math, & Science. The main goal of this project is to provide each student with a copy of The Lemonade War, in order to coordinate financial literacy instruction and activities in four elementary schools during the fall of the 2017 school year. The culminating event will be in conjunction with Read for the Record 2017. Economics Arkansas has designed sample financial literacy curriculum for this book as part of the project, Arkansas Reads One Book. The book addresses justice, fairness, perseverance, loyalty, and trust; as it teaches the basics of financial literacy. Jody Vines, Marsha Snell, John Davis, & Suzette Calloway – Washington. Approximately 720 5-6th graders. Subjects: Reading, Math, Engineering, Science. The major goal of this project is to engage students in a cross-curricular study building literacy and STEM (Science, Technology, Engineering, and Math) skills. Students will use the engineering design process and authentic learning opportunities to complete challenges related to a three-week cross-curricular study of the works of the Brothers Grimm and Hans Christian Anderson. Aesop’s Fables also will be used to teach character education. Students will use fables as discussion starters to author their own stories, books, craft structures, and more. Area businesses and college personnel will be invited to assist with various projects, as students work collaboratively to bring fairy tales to life. Cynthia Chisholm – Northwest. Approximately 486 K-4th graders. Subjects: Computer Science, Reading, Writing, & Math. Ozobot Coding Classroom Kit will allow students at all grade levels to work together to create code, by being challenged to program tasks and discover codes on their own in a variety of disciplines. It will enhance the classroom by allowing students to think in different ways to solve problems. The project will aid in teaching critical thinking abilities. They will learn math concepts, logic, project design, collaboration, communication, perseverance, and empowerment.